Modulight broadens their OEM laser system family to single-mode and multi-wavelength laser modules - Modulight, Inc. Modulight broadens their OEM laser system family to single-mode and multi-wavelength laser modules - Modulight, Inc.
Tampere, Finland – Jan 30th 2014 – Modulight, Inc., an ISO13485 certified laser manufacturer based in Tampere, Finland and San Jose CA, announced today two complementary additions to their OEM laser system platform. Whereas ML6500, released in 2013, introduced the smallest form factor and the widest wavelength spread high-power multimode laser modules in the industry, the new release complements this with the ML6400 single-mode laser systems and ML6600 multi-wavelength laser systems. The smaller sibling ML6400 footprints 2″x2″ and the 6″x6″ big brother ML6600 houses up to 3 different wavelengths in a single easy to use laser module. “We are excited about this addition to our OEM laser systems family that have received a great response from our customers since the release in 2013. This is again a direct response to the market needs we have already identified when developing the single-wavelength multi-mode laser ML6500 modules. Stable and easy-to-integrate UV and visible single-mode laser modules at 405–690nm are of great interest in the field of biophotonics and fluorescence microscopy. We complement these with our single-mode laser diode products at NIR region up to 1650nm to introduce again the widest wavelength span of such laser systems in the industry”, says Dr. Petteri Uusimaa, President & CEO of Modulight. “The key features of the ML6400 are stable CW output power and wide wavelength range from UV to NIR. ML6600 systems boast with a true 3-in-1 solution where we can basically take any of our single-wavelength ML6500 performance and squeeze that into a individually addressable multi-wavelength laser source with single output and control interface. This feature is demonstrated nicely with our pilot product ML6600-RGB designed for display and projection application that will be demonstrated in Photonics West show over 4th-6th Feb in San Francisco. 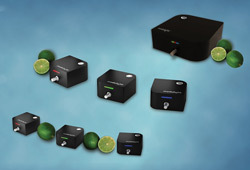 This product combines our separate 1W ML6500-RGB laser sources into a single 3W system that can either have 3W of each color or 3W combined RGB (635nm/532nm/465nm) output in an easy-to-use color controllable module. The beauty of this design really is that we can take any of the wavelengths between 405–1650nm that we support already with ML6500 and mix or combine those in ML6600 platform to address multi-wavelength applications or scale power at a single one. Obvious applications range from multi-wavelength laser systems in laser projection, surgery, dentistry, laser therapy to optical pumping solutions. We really would like to see people to visit us in Photonics West booth #1538) and challenge our platforms for their own application requirements. We tend to think we covered already a lot, but always welcome new ideas!”, concludes Mr. Kuusiluoma. Modulight, Inc. is one of the leading OEM laser solutions providers globally. As an original laser manufacturer the company offers laser products and services from chip to complete turnkey laser solutions at wavelengths from visible to infrared. Modulight serves a range of customers in the fields of life science, environment, industry, display and projection, and defense and security. The company is ISO9001:2008, ISO14001 and ISO13485 certified and based in Tampere, Finland and San Jose, CA.